Following on from last week’s post, Playing catch up PART ONE, here are some more random ramblings looking back at my earlier posts from February and March. First off, I read an interesting article in the Guardian last week that chimed in with my very first post way back in December 2006: Choirs are becoming cool. The article is called Choral satisfaction and begins with the sentence: “First it was knitting and embroidery, now choir practice is cool.” The article covers several choirs and makes interesting reading. The post Papa’s got a brand new song threw up a couple of comments. Fiona made the very valid point that “a player or singer who plays/ sings by ear is no less a musician than the one who reads the quavers and stave”. Yet we are still a mainly visual culture so people feel much more comfortable with something to look at. The majority of people find it very hard to just listen and take time to let something sink in. We want a quick fix and often don’t have the patience to listen again and again to a song, but expect to pick it up in a couple of goes (and then think we can’t ‘sing’ because we can’t learnt it fast enough!). The thing to remember is that in learning by ear, we’re trying to short-circuit a process that takes many years in most aural cultures. As Paul points out in his comment, a modern correlate to this is to use MP3s or a parts CD in the car, and simply listen to your part again and again. Although this is very effective, the main drawback, as Paul points out, is that it takes away the social and communal aspect of learning in a group. Where did you get that song? is uppermost in my mind at the moment as I’m trying to find suitable songs for my forthcoming men’s harmony singing workshop. This is a very specific area, so is a little harder to research. I’m trying to identify cultures where men sing together traditionally, i.e. there are special ‘men songs’ in the culture, rather than just a male voice version of a song. The obvious ones spring to mind: Republic of Georgia, chain gangs in the US, South African mbube tradition (e.g. Ladysmith Black Mambazo), Russian church music, sea shanties, etc. I’m sure there are more, and all suggestions will be gratefully received! On a similar note, it would be really useful to identify those cultures in the world which have a harmony singing tradition. I’m often asked by choir members why we don’t sing songs from India or the Middle East for example. Sure, there may be Western choral arrangements of songs from those parts of the world, but there is not an indigenous unaccompanied harmony singing tradition. I’m very tempted to go back to college to study ethnomusicology just to find out! I remember a Georgian ethnomusicologist once telling me about a European country which is bisected by the Danube, and regions south of the river don’t have a harmony singing tradition, whereas those regions north of the river do. Go figure! I’m still absolutely fascinated by the Singing memory. Again recently I have been in a position where I’m about to sing a song I’ve not sung for ages and have no idea how it goes, or what the words are, then I open my mouth and it all comes tumbling out! Does anybody else have the same experience? Also, I need to know the first word of a song sometimes to just remember how the tune goes, which proves to me at least that the words and melody are stored together in the brain. And the thing that never, ever ceases to amaze me is how the choir might leave a song alone for maybe a year or so which has not been going particularly well, then a year later, with no practice in between, they sing it perfectly! The secret is to leave the brain alone and it somehow manages to sort everything out without our conscious intervention. Thinking of the new singers in our choir, I’ve recently made another parts CD for WorldSong as we have a big anniversary concert coming up in the summer. This means that we now have seven parts CDs available, covering around 90 songs. As time goes by therefore, it becomes more and more daunting for new members as they realise that they have such a lot of past repertoire to catch up with (WorldSong now have about 190 songs in our repertoire, including rounds and warm-up songs). I try to make it very clear that there is absolutely no necessity to learn any of the oldies. I always make sure that there are at least half a dozen songs that new members can join in with in their first concert. I suggest that people make a note of any old songs they hear that they really like, and then take plenty of time to learn them from a parts CD one at a time. Nevertheless, there are still people who feel that they need to catch up and buy all the parts CDs and try to learn everything! I’m still wondering where all the male singers are and trying to get more men to sing by running an annual men-only harmony singing workshop. Knowing how quickly people get booked up, and also how often work intervenes in men’s leisure activities, I sent out a round robin email earlier in the year to let people know the date and place of my men’s workshop. I’ve recently sent out the final details and have had quite a few replies letting me know that they’re still interested, but unfortunately are busy on the day! I do find that women in general tend to prioritise their leisure and social activities more. I just hope I get enough blokes to make it worthwhile this year! 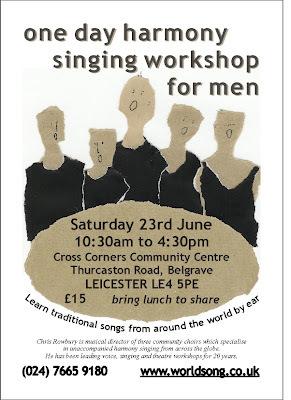 It’s always fun and we end up making a great sound, so please spread the word to any guys who you think might be interested: Men's harmony singing workshop on June 23rd in Leicester . Been having some interesting conversations in Minor Chords recently about where we might go next, and how we might up our game a little. This has brought up the issue of trust again. A consensus seems to be that people want me to be stricter and not let them get away with so much! Well, that’s just not my style. I figure that we’re all adults now and it’s up to choir members to find their own motivation, self-discipline, professional attitude, etc. Part of me trusting choir members is that I believe it brings out the best in people, but the other side of it is that I don’t see it as my job to discipline people or to keep on their case. We’re not at school any more, so singers have to take their own responsibility. My job is as an enabler and facilitator. However, as Tony points out in his comment, being patient 99% of the time means that when I do let rip, people know that I really mean it!! Got quite a few comments about my Get in line post. Seems that lots of people enjoyed it and could really relate to it! This Saturday (9th June) I’ll be taking three choirs to the Royal Festival Hall’s ‘Overture’ weekend to make one big choir of 100 singers. We'll be doing a half hour set on the stage outside the Hayward Gallery at 3pm. Although I will have rehearsed two choirs personally, and the third knows the same songs, we will not have had a chance to rehearse together. Since I trust that everyone knows what they’re doing (see above), the singing should be fine. I’m most worried about how to get 100 people on stage into the correct places and not look like a right mess! It turns out though that we won’t have a chance to actually try out on the stage, but will just have to busk it. Wish us luck! So maybe I didn’t have a great time at our Woven Chords concert in March. But I had an even worse time at our Minor Chords concert in April as part of Stamford’s Festival of Performing Arts. Our rehearsal was fantastic, but the actual performance was not a patch on it. Mind you, as always, I doubt if the audience noticed anything awry (except when we had to start a song again because it was so badly out of tune!). Apart from the fact that it wasn’t really our usual sort of audience, there wasn’t really any excuse. For once, I don’t think any of us really enjoyed it! Yet a few weeks later in a small village hall on a tiny stage, we performed a whole evening’s worth of songs and all enjoyed every minute of it. It’s such a subtle and uncontrollable thing that you just have to go into it with wide-eyed enthusiasm each time, and hope for the best. Let’s hope Saturday at the Royal Festival Hall is a good one!! I’m going to stop there and cover my April and May posts in the final look back next week.